WASHINGTON — Earth's protective ozone layer is finally healing from damage caused by aerosol sprays and coolants, a new United Nations report said. The ozone layer had been thinning since the late 1970s. Scientist raised the alarm and ozone-depleting chemicals were phased out worldwide. As a result, the upper ozone layer above the Northern Hemisphere should be completely repaired in the 2030s and the gaping Antarctic ozone hole should disappear in the 2060s, according to a scientific assessment released Monday at a conference in Quito, Ecuador. The Southern Hemisphere lags a bit and its ozone layer should be healed by mid-century. "It's really good news," said report co-chairman Paul Newman, chief Earth scientist at NASA's Goddard Space Flight Center. 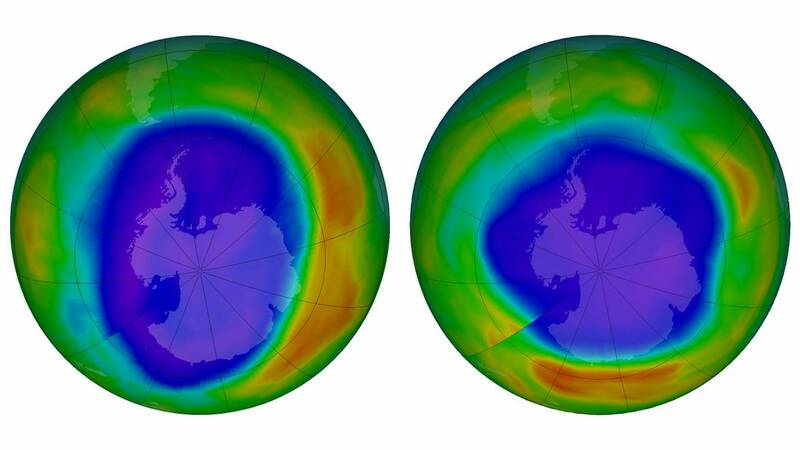 "If ozone-depleting substances had continued to increase, we would have seen huge effects. We stopped that." High in the atmosphere, ozone shields Earth from ultraviolet rays that cause skin cancer, crop damage and other problems. Use of man-made chemicals called chlorofluorocarbons (CFCs), which release chlorine and bromine, began eating away at the ozone. In 1987, countries around the world agreed in the Montreal Protocol to phase out CFCs and businesses came up with replacements for spray cans and other uses. At its worst in the late 1990s, about 10 percent of the upper ozone layer was depleted, said Newman. Since 2000, it has increased by about 1 to 3 percent per decade, the report said. This year, the ozone hole over the South Pole peaked at nearly 9.6 million square miles (24.8 million square kilometers). That's about 16 percent smaller than the biggest hole recorded — 11.4 million square miles (29.6 million square kilometers) in 2006. The hole reaches its peak in September and October and disappears by late December until the next Southern Hemisphere spring, Newman said. The ozone layer starts at about 6 miles (10 kilometers) above Earth and stretches for nearly 25 miles (40 kilometers); ozone is a colorless combination of three oxygen atoms. If nothing had been done to stop the thinning, the world would have destroyed two-thirds of its ozone layer by 2065, Newman said. But it's not a complete success yet, said University of Colorado's Brian Toon, who wasn't part of the report. "We are only at a point where recovery may have started," Toon said, pointing to some ozone measurements that haven't increased yet. Another problem is that new technology has found an increase in emissions of a banned CFC out of East Asia, the report noted. On its own, the ozone hole has slightly shielded Antarctica from the much larger effects of global warming — it has heated up but not as much as it likely would without ozone depletion, said Ross Salawitch, a University of Maryland atmospheric scientist who co-authored the report. So a healed ozone layer will worsen man-made climate change there a bit, Newman said. Scientists don't know how much a healed ozone hole will further warm Antarctica, but they do know the immediate effects of ozone depletion on the world and human health, so "it would be incredibly irresponsible not to do this," Salawitch said. And the replacements now being used to cool cars and refrigerators need to be replaced themselves with chemicals that don't worsen global warming, Newman said. An amendment to the Montreal Protocol that goes into effect next year would cut use of some of those gases. "I don't think we can do a victory lap until 2060," Newman said. "That will be for our grandchildren to do."